The continued detention of Libyans held prisoner long-term without trial or any other legal process was condemned at a workshop in Tunis today. Most, although not all, have been held since the 2011 revolution. There are no authoritative figures on those held, but an official from Bani Walid put the number at between 7,000 and 8,000 across the country. He claimed that this included some 900 women held at the Ruhaimi prison in the Tripoli suburb of Ain Zara. They were mostly members of Qaddafi’s Revolutionary Guard, he said, although some had been otherwise involved in the former regime, such as policewomen. The figures do not include those seized and held privately by clandestine militias or armed gangs. 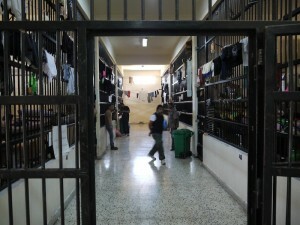 Of long-term prisoners from Bani Walid itself, he said there were now less than 100 being held. The figure had been higher, but had come down recently. Some were former Qaddafi soldiers he said, but not all. None, he added, had been involved in politics. Of the total number still detained without trial, six were in Misrata, he divulged. However, most of those who had been held there had now been released. The two-day workshop on the issue, organised by UNSMIL and supported by the UNDP, is designed to come up with recommendations to the authorities so that those held are with properly tried or released. Some 40 bodies from Libya and elsewhere are taking part. These include Libyan NGOs and representatives from around 20 municipalities.